Hey! Hey! Those Were The Monkees! Such a weird, contrasting time last Wednesday at the The Long Center in Austin, Texas. On one hand, you had the Sound & Screen series rocking out to School of Rock and some cover band. On the other, you had a show going on inside that spanned many generations. What was it? Well, it was The Monkees. An American answer to the Beatles that comprised of some actor-musicians. It started out as a show and turned into an actual band. They were touring again and I just had to see them. First off, let’s talk The Long Center. It’s the first time I’ve been there and it reminds me alot of the Bass Concert Hall. Very formal and very easy going. In fact, you couldn’t bring any red wine or food into the concert hall. A small issue, but not as big as say banning or enforcing camera usage policy. Oh and for some reason, they like to put your beer into a sippy cup for the show. Okay. Just like I got with my Happy Meals at McDonalds. Now on to The Monkees. For those not in the know, they were a industry created beast to battle The Monkees. The show was successful enough and they opted to tour and continue on making records. In fact, Head was a big push back from the corporate connotations that came down on them and their style. To avoid being labelled phony, the crapped out a psycho movie that had the likes of Jack Nicholson. So their time came and went and now they do reunion shows every once in while. Davy Jones died last year but yet they forge on ahead. On of the sweeter moments of the night included a tribute to Davy Jones with some kids from the audience singing to Daydream Believer. There sweet moments all around. Mickey had a strong voice throughout the show even though he had some problems with The Porpoise Song. Mike was steady handed and even, though he didn’t move around much. Peter was a bit more lively but you could definitely sense the old age in his singing voice. That said, it was a valiant effort and the songs took me back to the days of watching the television show as a kid. Clips of the television show and the movie played out throughout the show and helped define what The Monkees were. They were a pretty good 60s pop band that put their stamp on every type of genre of music that was available to them at the time. Taking some time to look back at that was well worth the price of admission. And what they may have lost in aging, they never lost in charisma. 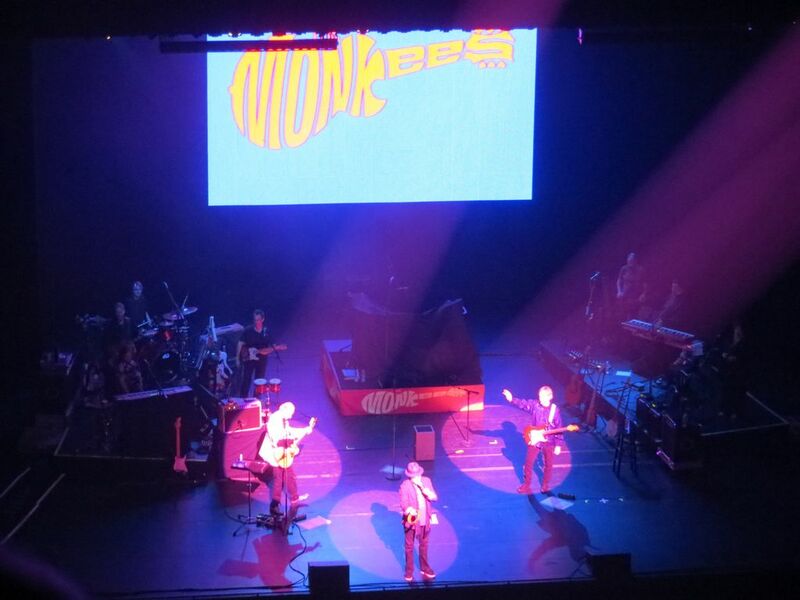 The Monkees were as tight as ever and had us all in the palm of their hairy knuckled hands.